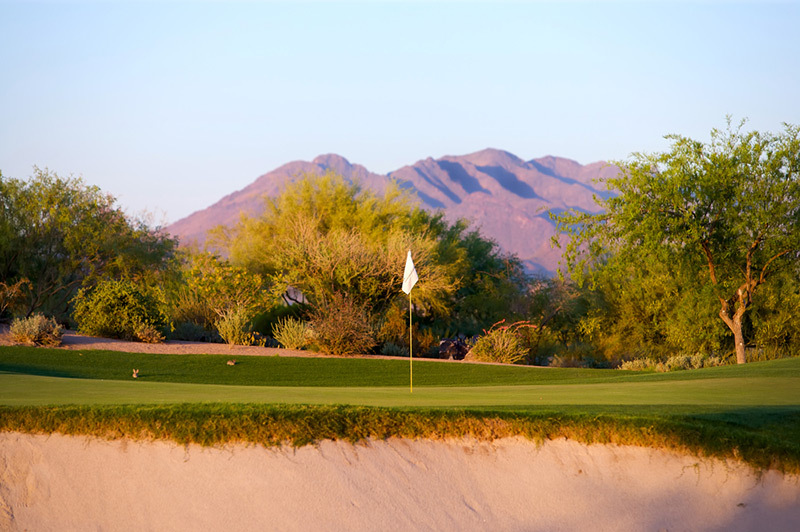 Golf courses use a significant amount of water because of their size and the irrigation requirements of turf grass in the dry conditions of Arizona. Design and maintenance feature prominently in how much water a course uses. For this reason, agencies and communities throughout the state have established water conservation requirements for golf courses and other large turf areas in plans and codes and may require that reclaimed water or other renewable water supplies be used for irrigation. Using reclaimed water may require periodic flushing of salts below the root zone to prevent damage to the grass, which can be factored into water use regulations. The Arizona Department of Water Resources (ADWR) sets water use requirements for all golf courses in the state’s active management areas (AMAs). For example, in the Prescott AMA, water use on an 18-hole course is limited to 441 acre-feet a year, with incentives to use reclaimed water. ADWR regulates all “turf-related facilities” in AMAs that have ten or more acres of “water-intensive landscaping,” including parks, schools, cemeteries, and residential common areas. Allotments are based on the number of acres in three landscape categories multiplied by an efficient water application rate for each. The three categories are turf, low water use landscaped area, and water surface area. Outside of AMAs, communities have limited options to regulate existing golf courses, but can set conservation and design standards for new golf courses or other large turf facilities through development codes, ordinances, and standards. They can also find opportunities to replace potable water with treated wastewater at existing turf facilities. For example, Sierra Vista regulates water use by new parks and golf courses by limiting high water use turf to areas of heavy use, such as playgrounds and playing fields, and requiring new golf courses be irrigated with reclaimed water, harvested rainwater, or an alternative supply to groundwater. The City of Cottonwood plans to irrigate Riverfront Park with highly treated effluent, replacing water diverted from the Verde River. The Town of Camp Verde, which is not in an active management area (AMA), has adopted conservation requirements for golf course development that require demonstration that the course will meet the standards set by the Arizona Department of Water Resources (ADWR) for golf courses in the AMAs. This requirement includes limiting the irrigated area to five acres per hole multiplied by a water allotment, and limiting the water use to a per-acre allotment established by the Town’s Community Development Department. The Town also requires that any planned golf course must be included in the ADWR adequate water supply application for the entire development prior to recording the final plat, final site plan, and construction of the golf course. In addition, developers must demonstrate that there will be sufficient effluent or other renewable source of water to meet the entire irrigation needs of the course. This requires submittal of a water balance study showing there will be sufficient renewable water produced by the development or otherwise available. The Town provides criteria for the water balance study in a brochure available from its Community Development Department. Camp Verde requires that irrigation and stormwater retention systems be engineered to provide for the short and long-term needs of the turf as well as for the unmaintained areas of the golf course, and that the systems be designed with strategies that are “environmentally responsible” and ensure that they will be efficiently and cost-effectively maintained.